What’s an everyday carry bag? Well, it’s a pack that goes wherever you go. It’s a bag that will constantly be by your side (or on your back) stuffed with your daily essentials. With this in mind, such a bag need not be too big, right? And it’s even better if it’s lightweight. But most importantly, it has got to be durable. This bag should be able to take a beating every day yet return home in the evening unperturbed, ready to do it all over again the next day. If you’re in search for the perfect everyday carry bag, I might suggest the handy little companion from Red Rock Outdoor Gear called the Rover Sling Pack. It roves around with you, hanging over your shoulder onto your back. And just like the perfect daily pack, it’s lightweight and durable. Here’s the Red Rock Rover Sling Pack Review. Everything about it screams portability. With dimensions of 5.5 inches by 11.5 inches by 8 inches, the Rover sling bag bears a small frame. And with an even smaller weight of about 1.6 pounds, this bag is perfect for carrying your basic tactical gear for a short expedition. If you’re camping and want to go on a short hike, stuff this bag with what you’ll need and get going. The red rock rover sling pack is made of a 600 denier polyester which, in short, means it’s very durable. This polyester is capable of withstanding the harsh outdoor environment yet still holds your gear nicely inside it. 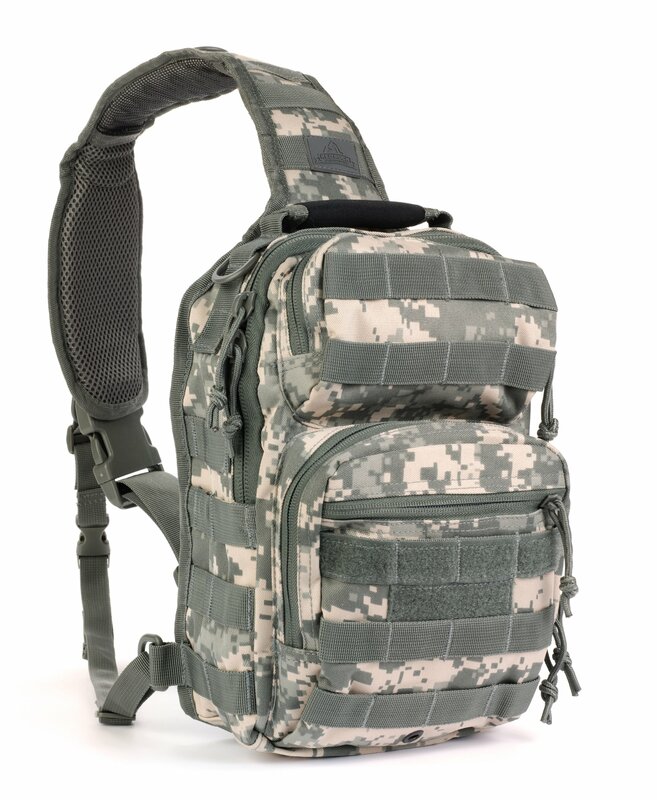 The tactical bag won’t wear quickly and will take a battering without showing signs of strain. Another quality denier polyester endows this bag with is a waterproof capability. You could be out in the rain, but it won’t allow water to penetrate into the bag and damage your items. The Molle Webbing allows you to expand the storage compartments of this bag by attaching extra pouches onto it. You could attach a holster pouch if you’re a pistol carrier, a knife pouch- of course, you need a knife while in the outdoors. You might not need the Molle attachments, however, as this bag has got enough compartments for most of your needs. There are 2 zippered compartments on the front, one zippered pouch inside the main compartment, two other pouches on the inside and a snap closure concealed carry pocket on the back panel. You can carry anything from a first aid kit, binoculars, and ammunition to your phone charger or iPad. The Red Rock Rover Sling Pack will accommodate it all; nothing will be left behind. Q: Can this bag hold a 15-inch laptop? A: Perhaps not. It can accommodate a 10 inch iPad, but a 15-inch laptop might be too big to fit. Q: How many color options are there for the Rover Sling Pack? A: You can choose from the ACU, Coyote, Olive Drab and Woodland Digital options. This bag is certainly ideal for your day to day use. For the tactical lifestyle, you can use it to complement your bigger tactical backpack. The durability of this bag is astounding, and the comfort is perfect for an everyday carry pack. With all the compartments it has, you won’t have to worry about leaving anything behind. And with the Molle webbing, attach more pouches to ensure you carry more gear. Its highlight, however, is the comfortable ambidextrous strap that hangs over either the left or right shoulder. All these make for an excellent tactical pack, no doubt. And, of course, it’s highly affordable. What more could you ask for?